We report on an exploratory project aimed at performing immersive 3D visualization of astronomical data, starting with spectral-line radio data cubes from galaxies. This work is done as a collaboration between the Department of Physics and Astronomy and the Department of Computer Science at the University of Manitoba. We are building our prototype using the 3D engine Unity, because of its ease of use for integration with advanced displays such as a CAVE environment, a zSpace tabletop, or virtual reality headsets. 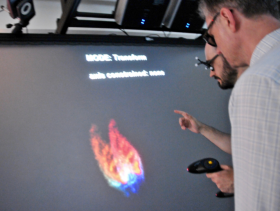 We address general issues regarding 3D visualization, such as load and convert astronomy data, perform volume rendering on the GPU, and produce physically meaningful visualizations using principles of visual literacy. We discuss some challenges to be met when designing a user interface that allows us to take advantage of this new way of exploring data. We hope to lay the foundations for an innovative framework useful for all astronomers who use spectral line data cubes, and encourage interested parties to join our efforts. This pilot project addresses the challenges presented by frontier astronomy experiments, such as the Square Kilometre Array and its precursors.